Combining all things classy and sassy, Karma has brought a glint of glamour to Islamabad by offering all its collections at the first ever Karma Concept Store in the city. Islamabad is one of those quite cities trying to shake off all its diffidence to transform into a happening city by putting on some bright lights, great heights, the hustle and bustle, and glamour. And the launch of the Karma store last weekend has only added to the charm of the city. “Karma’s philosophy is to bring together elegance and glamour under one roof in a unique shopping environment,” says Maheen Kardar Ali, founding Designer of Karma, Pakistan’s top fashion house. The store offers designer dresses and accessories for the fashion-savvy. “We are pleased and excited to open Karma outlet in such a high-traffic area of the city” adds the dynamic designer donning one of her creations. Sprawled over 6000 sq feet and located in the heart of Islamabad the store offers all its four brands: Karma Red, Karma Pink, Karma Princess and MK Nation. Karma Pink offers ready-to-wear garments; Karma Red offers a wide selection of couture dresses; Karma Princess for little girls and recently-launched MK Nation for the younger lot. The event brought together fashion lovers, top models, and socialites of the city, each one of them simply relishing in the splendour of the evening while glancing a look at the showcased dresses ranging from quirky to classy and sassy. Visitors were excited to get an exclusive glimpse of what looked like a royal palace from outside. Walking into the store was like moving into symphony impeccably adorned with grand chandeliers and fine couches, and embellished wardrobes resplendent with designer clothing. “I’m glad I didn’t miss this royal experience and an enchanting ambiance!” remarked Naila Umair, a guest. 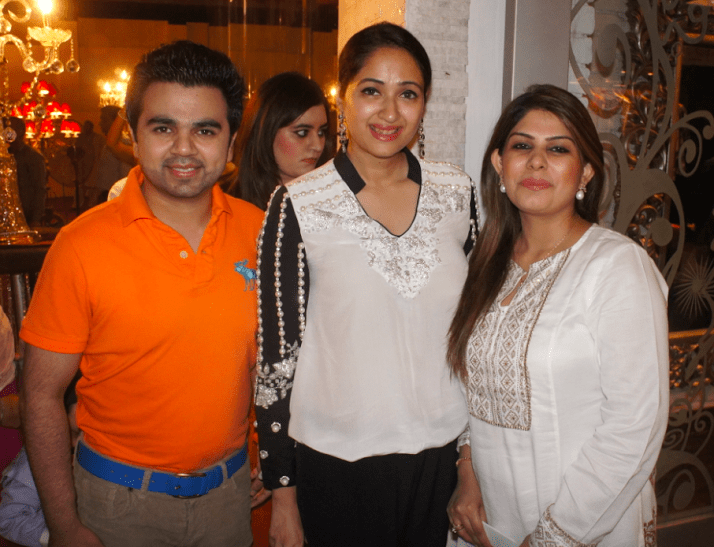 Maheen Kardar at the launch of Karma. Design Director of Karma, Maheen Kardar Ali and CEO Saad Ali welcomed the fashion feisty crowd of Islamabad to celebrate an impressive launch where super models paraded around in signature Karma Bridals. The launch event that was all glitz and glamour was arranged by Rezz Events and QYT Events, both known as specialists in organising high-profile and celebrity events. The artful decoration of the store, an ode to the youthful classiness and feminine vigour that defines karma, was the work of talented team at Designers East and NK Interiors. After an enchanting performance at PFDC Fashion Week and opening of concept stores in Lahore and Karachi, Karma has brought its latest collections for the citizens of Islamabad and Peshawar who can easily access the brand now. Karma is the leading luxury fashion house of Pakistan that boasts of a clientele of more than 6000 women, two couture studios, and nine Karma Pink stores. Founded in 2000, and driven by principles of originality, funk and professionalism, Karma swiftly made its place in Pakistan’s fashion industry and is now one of the recognized brands locally as well as globally.